Last Saturday saw the opening of a new section of Dublin’s light rail system. A 4 km branch line extension has been added and runs between the existing Belgard stop and Saggart Village. It contains five new stops. Two of the stops contain park and ride facilities. I went along on the free open day to try it out. First impressions were excellent, the trams were very clean, frequent and two new park and ride facilities are available. It was really nice to see that a celebration event was held by Luas to mark the opening. This was held adjacent to the line close to City West Shopping Centre. Also every new stop had face painters and clowns on hand along with free gifts, balloons and sweets for all users. Its a pity this isn’t done more often for the opening of new pieces of infrastructure. Recent sections of motorway have been opened with very little fanfare. On the down side, the red line crosses many traffic intersections, has many stops and slow corners. The result is that travel times are relatively long. 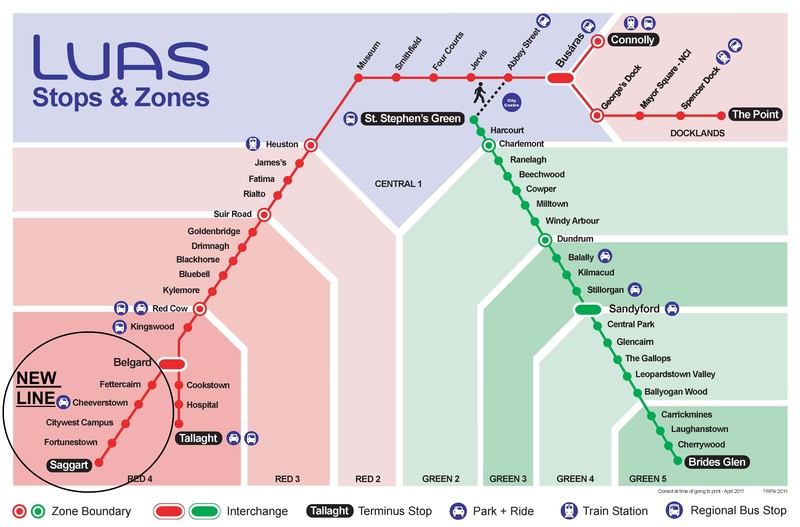 The travel time from Saggart to the City Centre Bus Station (Busaras) is estimated by Luas to be 49 minutes, but the distance is only 18km. By way of comparison with the Irish Rail commuter service, if we take the journey between Dublin and Monasterevin which has the same travel time of 49 minutes as above, we notice that the distance covered is substantially larger at 59 km. While means Dublin’s commuter train service is more than three times faster than Luas. 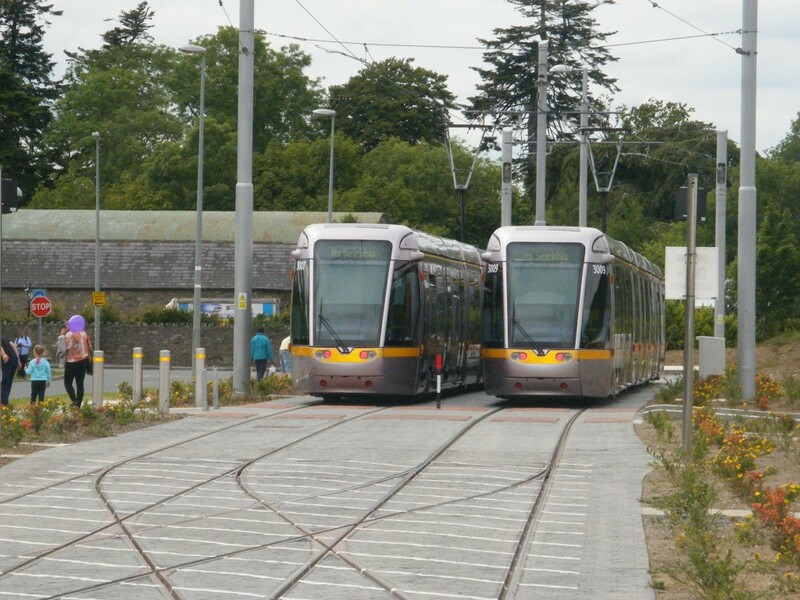 Therefore, while Luas is useful for short journeys, its slow speed means that the length of both of the two lines has probably exceeded the maximum desirable length for an on-street light rail system. Commuter main line trains would be a better solution to reach the outlying parts of Dublin rather than simply extending the Luas further and further. A solution to this problem would be to link the terminus of each Luas line to the main line rail network, either by tram or rail. 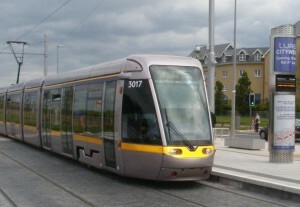 This would be possible as the terminus of the Green Luas line is only 1.7km from the mainline rail network, i.e. Shankill DART station. While the Terminus of the red Luas line is 5km away from the Dublin to Cork mainline rail network. If these were linked it would give commuters living in outlying areas served by Luas a choice of using a fast mainline train combined with Luas for their commute but more importantly it would link the systems providing significantly more journey options for travelers. Just used it this week from the Point as I’m working out that way, but the lack of any pedestrian access to the citywest stop from fortunestown lane means a hell of a long walk around. Also with a Luas changeover needed it takes about 1hr 10m. Probably stick with the car. Pity as it’s very comfortable. I chanced upon your piece here and saw you mentioned that the Cherrywood Luas is only 1.7 km from Shankill Station. This is something that I wrote a piece about some years ago. I have extracted the start of it and put a lik at the bottom. As the crow flies, Cherrywood Luas Station is 1200 meters (that is three quarters of a mile and a brisk 10 minute walk) from Saint Anne’s National School in Shankill. However if you were to walk it the only way possible, it would be over three kilometers. Not only this, but a major accident and emergency hospital, Saint Columcille’s in Loughlinstown is a mere 600 metres as the crow flies, from the terminus. That is a six minute walk – but again the long way around is over three times that. This is illustrated on the right. The problem is, of course, that the Shanganagh river valley is in the way and the only way to get to the other side, assuming you are not a crow, is via Wyattville bridge.